John Lawrence Narz Jr. (November 13, 1922 – October 15, 2008) was an American radio personality, television host, and singer. Narz eluded the infamous quiz show scandals to forge a respected hosting career. Narz was born in Louisville, Kentucky. The son of John Lawrence Narz Sr., he had a younger brother, James, who changed his name to Tom Kennedy and went on to have his own career as a television host. Narz was an announcer at KXO-AM, El Centro; KWIK-FM, Burbank; KIEV, Glendale; and KLAC-AM, Los Angeles, all in California. Narz began his early career doing voice work as one of the narrators for Adventures of Superman. Narz also made appearances in local Los Angeles television and served as the announcer on one of TV's first nationally broadcast children's shows, Space Patrol. Narz first achieved television fame in 1952, when he was the on-camera announcer and narrator of the sitcom Life with Elizabeth starring Betty White. In 1955, as he did on radio, Narz served as the announcer-sidekick of bandleader Bob Crosby on The Bob Crosby Show on daytime TV. 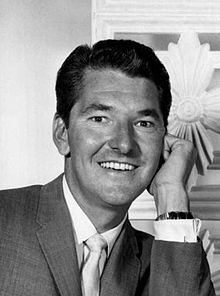 That same year, he also worked as announcer on Place the Face, a game show hosted by Bill Cullen and earlier Jack Bailey. By the end of 1957, Narz's career success forced his family to relocate from southern California to the suburbs of New York City. In January 1958, Narz began hosting his own game show, presiding over CBS's Dotto. Within a brief time the show became very popular, with Dotto running five days a week on CBS and, beginning in the summer of 1958, weekly in prime time on NBC. Dotto was later part of the 1950s quiz show scandals and was the first popular quiz show to be canceled as a result. Narz was not involved in the deception and cheating on "Dotto," and was immediately absolved of any responsibility when the story broke. Narz immediately returned to television after Dotto's cancellation, hosting Top Dollar (and succeeding its first host, Warren Hull, as part of an arrangement made with CBS and the ad agency representing the Colgate-Palmolive Company and General Mills, with whom Narz was under contract at the time). In 1960, he guest-hosted for a month on The Price Is Right, while regular host Bill Cullen took a vacation. Later that year, he was the host of Video Village, but asked producers to let him leave the show due to personal reasons (Monty Hall succeeded him). After relocating back to Los Angeles, Narz hosted Seven Keys, which started as a local show, but then moved to ABC (1961–1964). It later returned as a local show on KTLA in Los Angeles until January 1965. This was followed by a 13-week run on a new NBC game show entitled I'll Bet. Narz began an association with Mark Goodson-Bill Todman Productions that lasted the remainder of his career beginning in 1969. That year, Narz began hosting the syndicated revival of Beat the Clock, doing so until 1972 when the show's announcer, Gene Wood, replaced him. In 1973, Narz started hosting Concentration. It aired in syndication until 1978 and was his longest-running job as host. He also emceed Now You See It on CBS from 1974-75. In 1979, Narz served as the announcer and an associate producer for the CBS revival of Beat the Clock which was hosted by Monty Hall. Narz also was used as a sub-announcer for Gene Wood on the NBC version of Card Sharks. Narz's last hosting duty of any kind on national television was on Password Plus, where his brother and fellow host Tom Kennedy traded places with him on the March 5, 1982 edition of the program; Narz had been a celebrity guest for the week along with Steven Ford. Narz's last television work was hosting the game show You've Got to Be Kidding on station KDOC-TV in Anaheim, California during the 1987–1988 season. Narz with brother Tom Kennedy and actress June Lockhart, 1968. While Narz and his brother Tom Kennedy (whose real name is James Edward Narz) forged successful individual careers as broadcasters, they also made occasional joint appearances. Jack Narz appeared on Tom Kennedy's You Don't Say! during its NBC run, and the syndicated It's Your Bet. Kennedy guest starred on Jack Narz's Beat the Clock, and Narz appeared on the Password Plus panel while Kennedy was hosting and even switched with his brother to host for half of an episode. Both brothers appeared on To Tell the Truth as celebrity panelists. In addition to his work as an announcer and host, Narz was a singer. He occasionally sang on The Bob Crosby Show while serving as its announcer. He also recorded an album, Sing the Folk Hits With Jack Narz (Dot Records 25244), which was released in 1959. Narz's first wife was Mary Lou Roemheld, daughter of Oscar-winning composer Heinz Roemheld and the sister of Bill Cullen's wife, Ann. They had three sons, John Lawrence III, David, and Mike, and a daughter, Karen. After their divorce, Narz married Dolores "Doe" Vaichsner, who was a flight attendant for TWA and American Airlines for almost 50 years. Narz died on October 15, 2008, following two strokes. ^ a b c d Leszczak, Bob (2015). From Small Screen to Vinyl: A Guide to Television Stars Who Made Records, 1950-2000. Rowman & Littlefield. pp. 242–243. ISBN 9781442242746. Retrieved 14 December 2016. ^ a b c Baber, David. Television Game Show Hosts: Biographies of 32 Stars. McFarland. pp. 192–196. ISBN 9781476604800. Retrieved 14 December 2016. ^ "Jack Narz, 85, Genial Host of Television Game Shows, Dies". The New York Times. 17 October 2008. Wikimedia Commons has media related to Jack Narz.